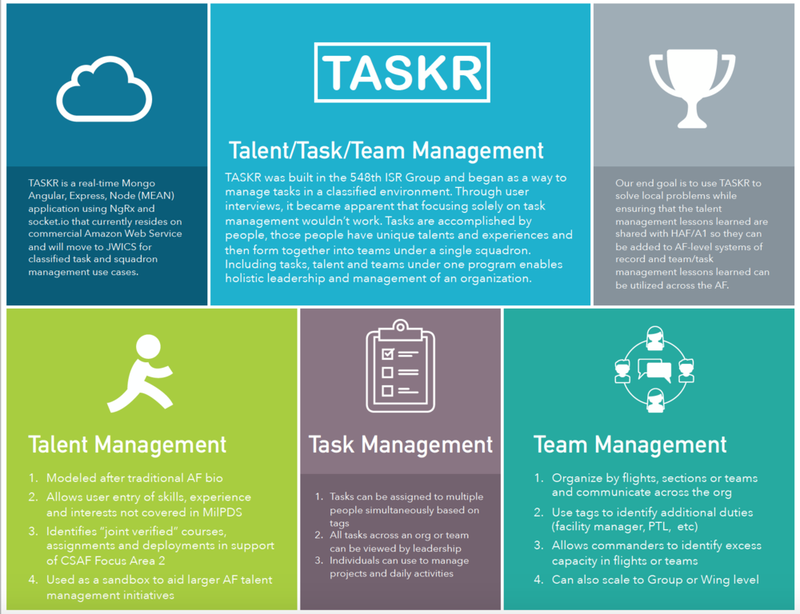 TASKR is a locally developed, cloud based, application built to manage talent, tasks and teams across an organization of any size. It was originally built to focus on task management and has evolved into also managing the talented Airmen who accomplish tasks and the teams they form throughout an organization. TASKR is now is focused on the problem statement: How might we manage human resources and mission requirements for any organization at a macro and micro level under one user interface in both a secure and non-secure environment? The team started by building individual “baseball cards” using the traditional Air Force biography format to ensure that standard information such as assignment history, education and date of rank from MilPDS were captured and then added the capability for the user to enter deployments, exercises and courses that are not captured in any other system of record. In order to aid with CSAF Focus Area-2 “Developing Joint Leaders” any entry can be highlighted as “joint verified”. This feature enables discoverability of the information from a talent management perspective. TASKR also allows user to enter any type of skill, such as design, running coach, python, project management, etc and then self-assess their proficiency level. This capability will transition to allow community endorsement of skills similar to LinkedIn. Users may also enter “interests” to provide leadership with more information when planning future professional development or deployment opportunities. Each interest or skill is attached to the baseball card as a “tag” which also allows personnel to be tagged with things like “facility manager”, “PTL”, “UDM”, etc. These tags will allow all UDMs across an organization to be tasked without knowing who the actual UDMs are. Each user can be tasked by anyone in their leadership chain and the individual task user interface is similar to TMT or GEARS except there is no limit to the number of accounts for each organization. Documents can also be loaded to into each task card. There are many different ways to visualize the task UI. 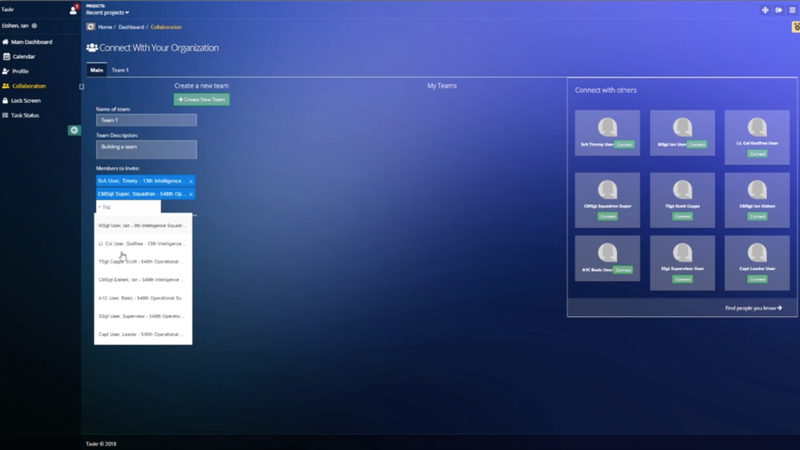 One of the features we are most excited about is the team management UI. This portion of the app will allow the talent management baseball cards to form teams. This can be used to form Groups, squadrons, flights, section, or project teams (project teams can be built for a specific task and then disbanded after the task is complete). “Tags” are used to identify skills, experience, positions, and types of tasks which allows rapid identification across large organizations. TASKR was built to solve a local problem but we feel that many of our lessons learned could be applicable across the Air Force. Over the next few weeks, we are going to expand and begin testing across a small number of units. Our unit is not resourced to maintain large scale software for the Air Force but we believe that our sandbox could provide HAF/A1 with user tested features that could be added to current talent management systems of record (Talent Marketplace, myVector, etc) and the rest of the AF may benefit from lesson learned with the task and team management portions of the app.